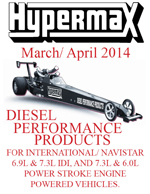 For use with the Hypermax H2 turbo system with the Hypermax Water Injection System. High performance applications such as truck pulling and drag racing only. Hypermax Intercooler for the Pulse Turbocharger Package. Fits 1988-1994 Ford 7.3L diesel. The intercooler utilizes a specially engineered core to generate up to 10% more power and 5% better fuel economy. Hypermax Intercooler for 1994 Ford 7.3L diesel with ford turbocharger. The intercooler utilizes a specially engineered core to generate up to 30% more power and 5% better fuel economy with lower exhaust temperatures for increased performance. Hypermax Intercooler for 1994-1997 Ford F-Series pickups with 7.3L Power Stroke diesel. The intercooler utilizes a specially engineered core to maximize flow: Over 20% greater flow capacity than the Ford factory cooler. Hypermax Tapercore Intercooler for Ford 7.3L Power Stroke diesel. The intercooler utilizes a taper sided core to maximize flow: 30% greater flow capacity than the Ford factory cooler.